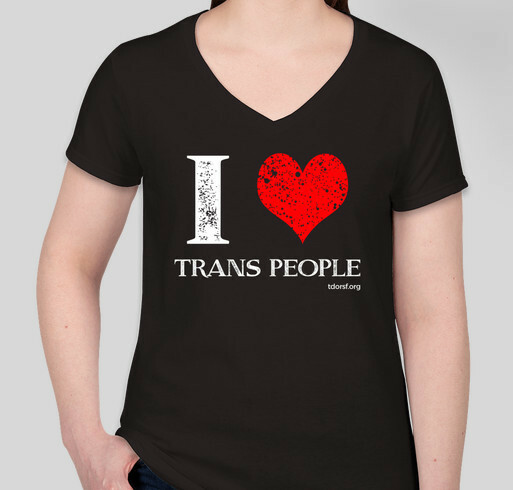 Show your love for TRANS people! Support our communities by showing trans people you love them and have their backs by wearing this shirt. All funds raised will go towards a memorial fund to help with passing costs for low income trans/gnc people in SF. All funds raised will go directly to St. James Infirmary . November is Transgender Awareness Month, join us in ending the violence against trans people! Trans and gender non-conforming people, particularly trans women of color, face massive amounts of violence and murder with at least 25 trans people murdered in the US alone in 2016. Almost 90% are trans women and almost ALL are trans women of color. Many incidents go unreported or are misreported for fear of discrimination, inaction or retaliation from authorities, so there are likely many more we don't know about. This is a straight up epidemic. We are calling on everyone, PARTICULARLY ALLIES, to show their love for trans people with this shirt. Aside from the violence, trans people also face disproportionately high rates of unemployment, homelessness, depression, PTSD, suicide and other things that create shorter, lower quality lives. We need to make things better and a small step is by showing trans people we're loved and welcomed by wearing this shirt. All funds raised will go towards a memorial fund for low income trans people and support projects working to end violence against trans people. Also, be sure to support your local TDOR event on November 20th. Check out more: www.tdorsf.org. Because I'm a trans and I love Trans people. Share Why You Support "Show your love for TRANS people!"